Sleep Bug is a free Windows 10 sound effects app which gives you soothing nature sounds to calm you down or help you sleep. 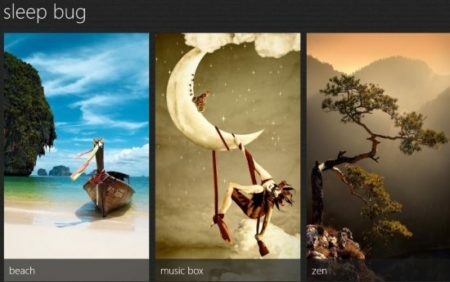 The app gives ambient sound mixer to produce a variety of scenes. This app can be used anytime for improving concentration, cutting out distractions, calming a busy mind, etc. The free version of the app offers 12 scenes and 21 different sound effects to be used. The paid version of the app offers 24 scenes and 83 different sound effects. The app can be downloaded from the Windows 10 store or from the link given at the end of this article. When you launch the app for the first time, it will look like the screenshot given below. Another thing to note is that the app doesn’t work properly in snapped mode, it works well in the full screen mode. As you can see in the screenshot above all the scenes are listed one after the other. Each scene has a name and a related image is displayed on it as well. When you click on a scene, it will open up in a full screen and the sound would start playing immediately. This can be seen in the screenshot given below. The app displays a time and date on the scene window. Apart from that the sound effects which have been added to this seen are displayed. Like in the above scene the sound effects added are birds, crackling fire, crickets, and owl. If you want you can mute any of these four sound effects. Or using the volume icon on the right you can also increase or decrease the volume of individual items, as seen in the screenshot below. The play/pause button can be used to turn the sound on or off. Whereas, the plus button lets you add more nature sounds to a scene. When you click the plus icon, a window opens up with all the sound effects mentioned on it by name. You can easily add any of these sound effects to your current scene. 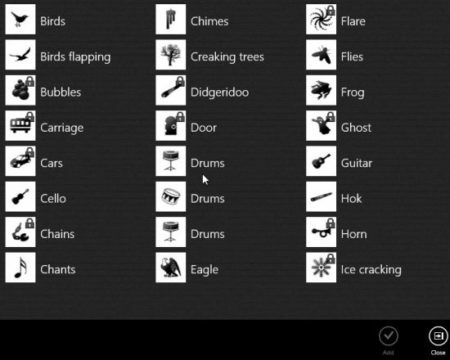 The screenshot below shows all the sound effects which can be added. 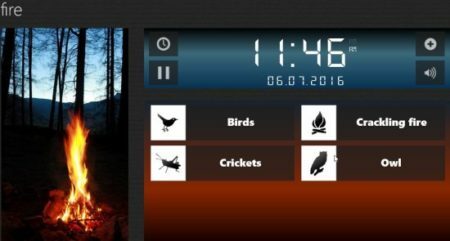 Each scene also has time and date displayed on it, that means that you can also set a timer on the clock. For example, if you are sleeping and want the sounds to stop once you have dozed off, then you can turn on the sleep timer. Just put in the number of hours and minutes in the sleep timer and you are all set. After the designated time the sleep timer will automatically stop all the playing sounds. Free version has 12 free scenes and 21 different sound effects which can be added to any scene. Volume of each item in the scene can be controlled. Keeps playing the sound in the background while you are working. Add sound effects to a scene. The app does not support ads. Sleep Bug is a nice app to play ambient nature sounds which can help you in improving concentration, calming your mind, relaxing, or even trying to sleep. The sounds of nature are often used for calming effects and this app gives you all those sounds to be used where ever you are. Try it out. Check out Sleep Bug for Windows 10 here.